We go through quite a lot of yoghurt in this house. All 6 of us enjoy it, so it is a standard dessert with berries, we use it to make pizza dough and scrolls and the kids all like to take it to school. To cut down on costs we used to buy in large tubs and spoon into our reusable squeezey pouches. But it is still not cheap, and unless you are buying plain natural yoghurt, then it is full of sugar, which I don’t love! The push for me to make my own was when I realised that 350g of the soy yoghurt that Ellie eats was costing almost $4 but I could buy 1L of Soy milk for just over $2. 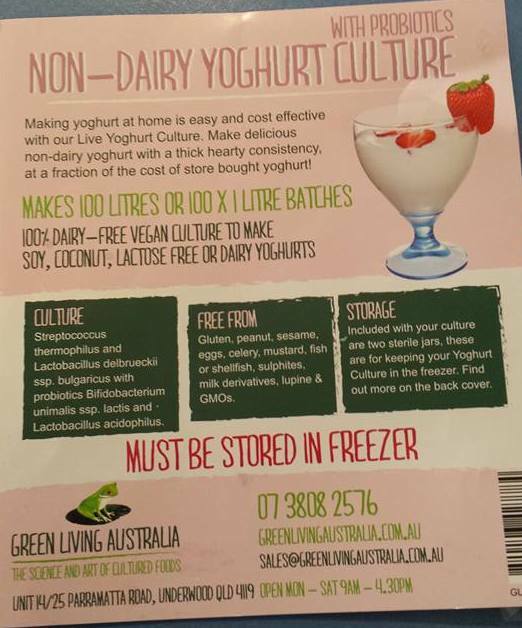 I did a bit of research and found that I could buy a non-dairy culture as a starter online. This is the one I use, from Green Living Australia. It was about $17 to buy, but contains enough starter to make 100L – not too bad!! You can use the non dairy starter to make dairy yoghurt too – but their Dairy Starter does a better job as they work at slightly different temperatures. The starter does need to be kept in the freezer. I adapted the instructions from Green Living Australia to make a couple of recipes that suit our family. The simplest way to go is to use UHT milk because it has already been heat treated. If you want to use fresh milk then you will need to heat the milk to 90C for 8-10 minutes and then allow to cool to between 37-42C before adding the culture. This allows only the bacteria that you want to culture to be left over! In a large saucepan place the milk, sugar if using and powder and whisk to ensure even distribution. Heat on a gentle heat until it reaches between 41-43C. Remove from heat and tip in culture. The amount required is very small! 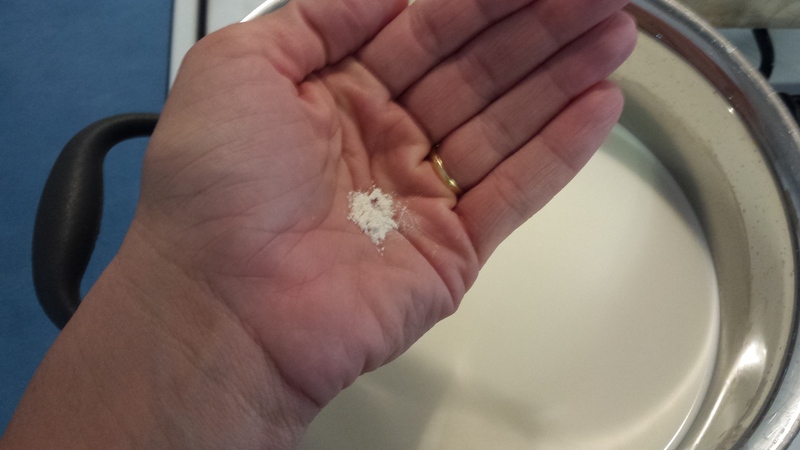 this quantity of powder is enough starter for 1.5L! Whisk again to ensure even distribution. The idea now is to keep the milk mix at this temperature for the next 18-24 hours. 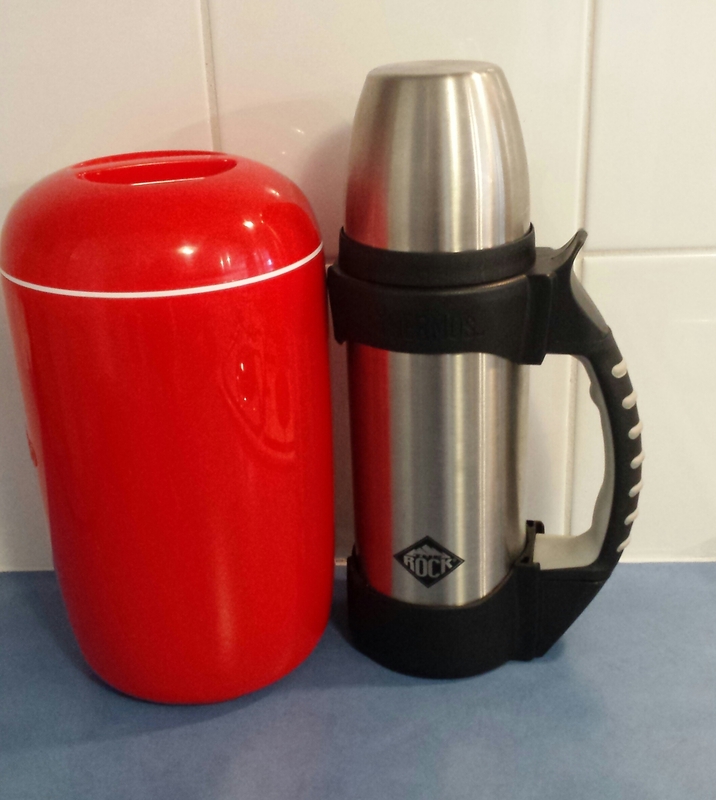 I use both the Easiyo container and my regular thermos (warmed with boiling water before tipping the yoghurt in) – both work equally well. An Electric yoghurt maker is a fancier option but essentially does the same job of keeping the mix at a stable warm temperature. After about 18-24 hours, check to see that the yoghurt is set, flavour it as you wish and then store in a clean container in the fridge for up to 10 days. We tend to leave the yoghurt plain in the fridge and then flavour it as we choose when we’re serving to allow for more variety – and for no flavour when we’re using it in dough. If you have tummy difficulties with lactose, then leave the yoghurt fermenting for the full 24 hours and the bacteria will have eaten almost all of the milk sugars (lactose) and you will essentially have a lactose free yoghurt. The sugar is optional in dairy milks since there is already lactose available to feed the culture, however, adding a simple sugar increases the carbohydrate available for the culture to eat and improves the end result. Green Living Australia say that the sugar is used up by the bacteria and won’t be there in the end. **I have recently started buying a ‘protein rich’ Soy milk which has the bean content upped to 21% and it makes for a really amazing thick yoghurt – much closer to the store bought variety! In a large saucepan place the milk and sugar and whisk to ensure even distribution. Heat on a gentle heat until it reaches between 37-41C. Remove from heat and tip in culture. The amount required is very small! 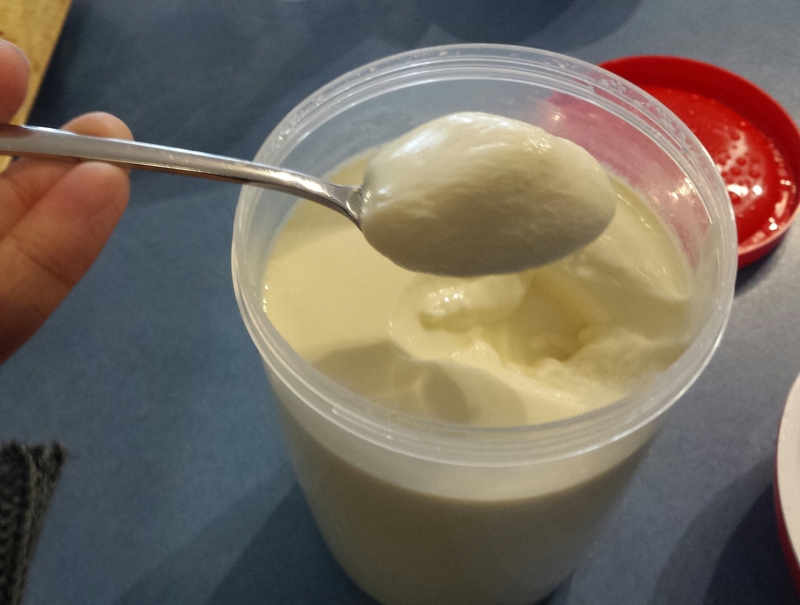 Place in Thermos/Easiyo container and follow same storage and flavouring guidelines as for Dairy yoghurt. The sugar isn’t optional when you are making soy yoghurt as the soy bean doesn’t have the same natural sugars to feed the cultures. The enrich the calcium content you can add a few drops of calcium carbonate before tipping in to the thermos, which also helps with giving a thicker yoghurt. To get a Greek style yoghurt you need to strain the end yoghurt through a nut milk bag. I have saved some Jalna greek yoghurt, frozen to use as starter. Can I do that for soy yoghurt and then save some of the new batch for the next round to “lessen” the dairy in each batch slowly? or use probiotic capsules? if so, how many? I want to give it a try before buying the batch of starter culture in case Mr Fussy doesn’t approve of it. You could do it with a starter yoghurt, it would depend on your level of dairy sensitivity. I haven’t ever tried I’m sorry as my daughter is too reactive. I think recipes often call for about 1/3 of a cup of a starter. Not sure about the probiotics either – not much help am I?! The cultures grow over time though so if you use a small amount it just takes a bit longer. Try one to start I’d guess. I’ve tried making with 2 probiotic capsules but it was watery and didn’t set at all. I also added 1 tsp of gelatine but didn’t help too. Is your texture more like pudding than yoghurt? Hi Eunice. No, the texture is like normal yoghurt. I haven’t made mine with the probiotic capsules as you can see from my recipe. Perhaps you could try the starter I mentioned in the recipe. Also make sure you’ve got the right temperature before you add the starter. Good luck! Will this recipe work for other non dairy milks like coconut or oat? We haven’t tried oat milk but I think it’ll work. Oat milk isn’t as high in protein so it might not be as thick. Oat milk is our regular drinking milk here so I might give it a go and update you. Not sure about coconut though. It’s a very different fat ratio.